As the name suggests, the Kairos Hall is our flagship auditorium. The building it occupies was built as part of an extension when extra accommodation was needed as the congregation grew. Its remarkably bright and airy appearance gives it a very welcoming feel in spite of its size. Natural light from large windows on three walls, together with a blend of colour coordinated natural materials, gives the hall a cosy feeling and a sense of well being. 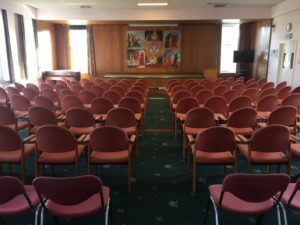 The room enjoys a beautiful wooden panelled stage, with a large projection screen, public address system and the option of a variety of different mobile multi-media set-ups. It has a capacity to seat 120 people, dependent on its setup and has a retractable central partition to accommodate smaller gatherings. Located on the first floor, the room has two double door entry points that give easy access points. The nearby lift offers full disability access to the hall. 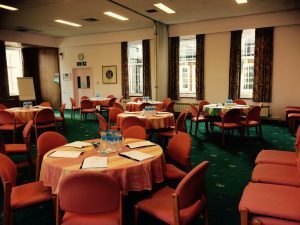 The daily rate to hire this room is £400. 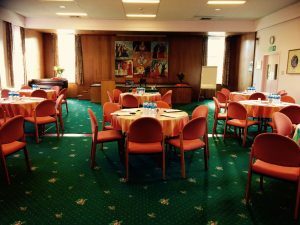 The Hall provides a venue for a broad range of functional set-ups.